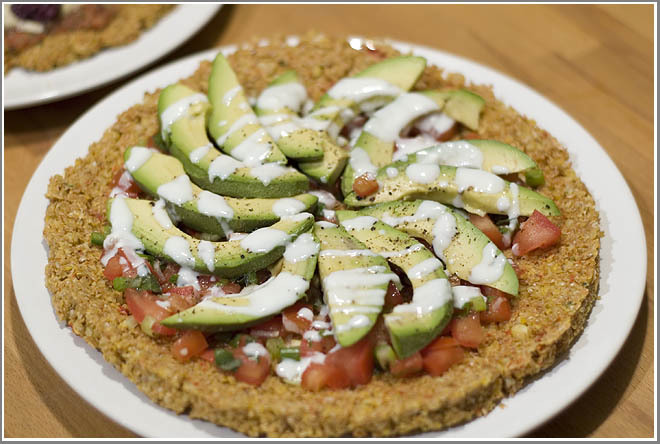 Tacos and Pizzas — RAW! In a previous raw food post, the eater and I tried out a local raw food restaurant. Now, armed with a few tools of the trade, I concoct my own raw wonders. We started off with a few books the eater purchased: Fresh-Ultimate-Live-Food and Complete-Idiots-Guide-Eating-Raw. I know it may seem a bit passe to buy an idiots book, but this one is really good. The book goes into all of the basics of raw foodism while leaving out all of the quack health claims. The book goes into good detail on how to cook raw and what sort of tools you need; everything from basic kitchen implements to my new favorite toy, the Excalibur 5 tray Dehydrator. The book concludes with loads of recipes and a few tips if you actually want to go raw. I’m pretty sure I’d never make the jump, but I’ll probably add some raw elements to my diet because I’m intrigued. For my first set of raw recipes I decided to make raw tacos and a few raw pizzas. I grabbed a few recipes out of the Idiot’s book and went at them. The first thing I noticed was that all of these recipes were easy. You can pretty much put whatever you want in the tortillas and the pizza; if you can get the mixture to stay together, it will work. I was surprised how easy it was to make substitutions for ingredients I either ran out of or didn’t have on hand. With the food science removed, cooking was a snap! The tacos consisted of a corn, tomato, and flax seed mixture that was ground up in the food processor and dehydrated until almost crisp. They were then formed into the familiar taco shape and dehydrated until crisp. The tacos were filled with all the fixings: lettuce, pico de gallo, and a raw meat that was made of sunflower seeds, tomatos, jalapenos, and a whole bunch of spices that I forgot — all dehydrated until crisp. I really didn’t miss much of anything in these tacos and probably could have ate about TEN of them; they were really good. I served up a side of chilled avocado soup that I improvised on the spot. 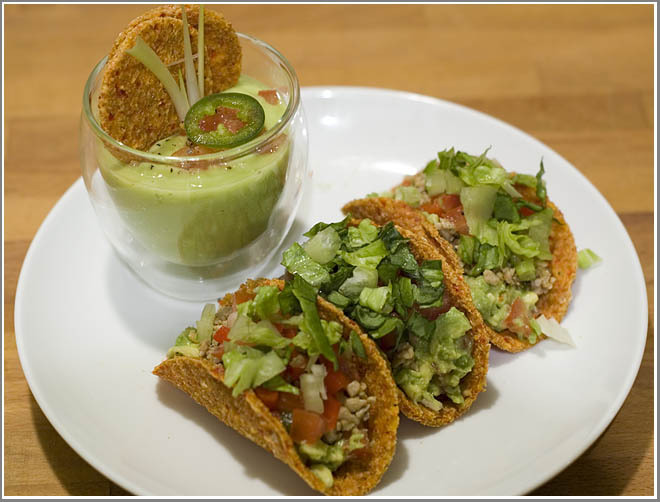 Key ingredients included avocados, jalapenos, and coconut water; it, too, was a hit. The pizzas were a different story. I tried a pizza dough recipe from the Fresh cookbook and also tried something of my own creation. While neither of the pizzas were all that bad, I don’t really think I’d mislead someone and call them pizza again. They really were more like an open-faced sandwich on a very dense bread. My Mexican inspired creation, for my money, was the better of the two. Both of these creations could really use some fine-tuning in the future. Overall I’d do it again. The new-fangled Excalibur Dehydrator has sparked my curiosity enough to dive into at least some raw-inspired dishes. I’m working on some raw breads and some sandwich wrappers that should go good with both raw and un-raw foods! Please, if you’re following a raw diet and it’s working wonders for you, curing cancer, the blind, or just making you feel good, that’s awesome. I’m not trying to attack or offend anyone here, it’s all in good fun. The tacos look great! It makes sense to dehydrate the shell rather than fry it, I bet it was tasty. Follow up on the avocado soup: I succeeded in making a delicious condiment, but failed at making a good soup(though I ate a soup sized portion, my eater was not able to and suggested we break out some chips). I think I should have doubled the amount of coconut water to avocado, and skipped the lime juice I threw in (made it too reminiscent of a guac). Any idea of the ratio you used. I was wishy-washy about buying it for a few months now. Right now, it’s totally worth it. I even used it to make fruit roll-ups and beef jerky. Go with the avocado soup, it was a winner! Oooo…. That dehydrator looks nice. Worth the chunk of change for it? I have been tempted to go the Alton Brown route and make one with a box fan but i am not convinced if I would save enough money to make it worth the effort. I think I have all the ingredients for the Avocado soup. That might be happening tonight.